A stunning picture book version of Roald Dahl’s hilarious classic, filled with full-size plates of Quentin Blake’s mouthwatering artwork. The Enormous Crocodile is a greedy, grumptious brute who loves to guzzle up little boys and girls. He’s a terrible boaster and very proud of his secret plans and clever tricks, like disguising himself as a seesaw for careless little children to sit on. Crunch! But the other jungle animals have had enough of this foul fiend’s horrid schemes – so they devise a plan to get the better of him, once and for all! Make a date with the world’s favourite storyteller for mischief and mayhem! 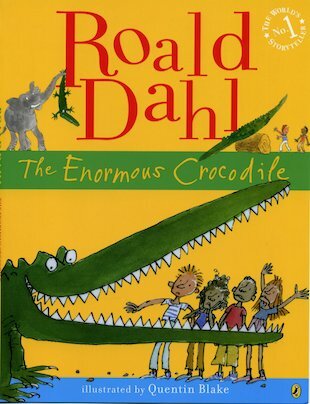 I thought this book was so amazing as a child, as it combined all the thigns i loved back then. A little bit of scare, some funniness, and children being eaten. I used to read it with school all the time, because i loved it that much! This book was good! In school we had a teacher in for training and so she passed this book around and then we painted a picture o what we the first picture that came into our heads. Two crocodiles in a mud pool. One is enourmous and always very hungry, his favourite snack is children! Can he be stopped? Amazing book and very funny. Haha, an utterly hilarious book which was a quick read, good for getting kids into reading. Simple yet it worked really well, easy to understand too which was good! Enjoy.